This simple, velvety soup with the aroma of an autumn woodland allows the delicately sweet flavor of chestnuts to shine. Fresh chestnuts are a popular staple in fall soups, both on restaurant menus and in the homes of creative cooks. Since chestnuts are a seasonal delicacy and aren’t available for most of the year, it’s a great idea to enjoy them as much as possible now while they’re fresh and at their best. Most recipes for chestnut soup pair them with a variety other ingredients like squash, parsnips, onions or celery root. Those soups can be delicious, but when you want to highlight the flavor of chestnuts, less is more. Less ingredients means that you’ll really taste the delicately sweet, nutty chestnuts, which can be too easily overwhelmed by other overly assertive ingredients. 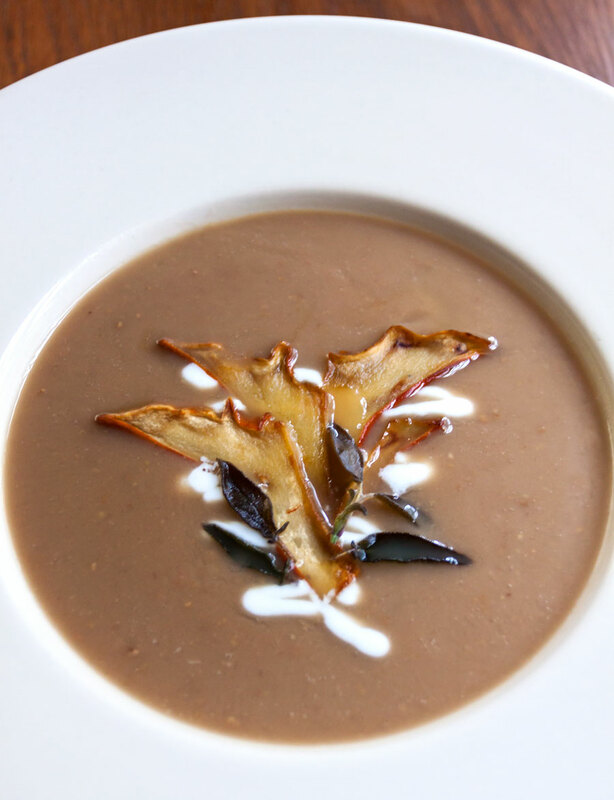 Here is our version, which is simplicity itself, using only fresh chestnuts and stock in the soup, finished with a scattering of wild mushrooms, crème fraiche and crisp-fried sage leaves, whose pleasing textures and tangy flavors offer interesting counterpoints to the naturally sweet, mild chestnuts. Here’s a new technique for removing fresh chestnuts from their shells. Cut each chestnut in half lengthwise. Place 10 chestnut halves cut side down on a paper towel and place into the microwave. Cook for 1 minute. Microwave settings can vary, so you may need to experiment a little to find the best setting and cooking time for your machine. Remove the chestnuts from the microwave and quickly pop them from their shells and husks while still very hot (once they cool, the husks become very difficult to remove). Set the cleaned chestnuts aside. Repeat until all chestnuts have been cleaned. Note: this method is a great way to prepare chestnuts for use in soups and other cooked dishes quickly & easily. However, they may become a bit too dry and chewy for eating out of hand. Try using this technique for delicious traditional roasted chestnuts. Pour the chicken stock into a saucepan and add the cleaned chestnuts. Bring to a boil, then reduce heat to low, add a pinch of salt and half-cover the pot with the lid. Simmer gently, stirring occasionally, for about an hour or until the chestnuts are very tender. Meanwhile, clean and cook the mushrooms. Brush them clean or if especially dirty, rinse quickly under cold running water and pat dry. Cut the mushrooms into thin slices about 1/8 inch thick. Heat 2 tablespoons olive oil in an non-stick skillet over medium-high heat. 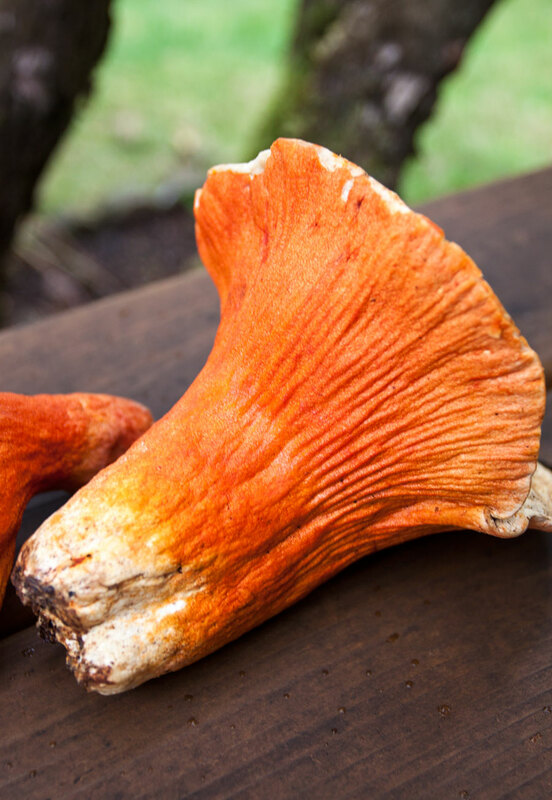 Use a pan that is large enough to easily accommodate all the mushrooms without crowding. If your pan is too small, just cook them in batches. When the oil is hot, but not smoking, add the mushrooms and quickly cook until all the liquid has evaporated and they are light golden brown and slightly crisped, but not burned. Remove the mushrooms from the pan and place on paper towels to drain. Sprinkle with a little salt and pepper. When the chestnuts are done, remove the pot from the heat. Using an immersible blender, food processor or regular blender, puree the chestnuts and stock until very smooth. The soup should be about the consistency of heavy cream. If too thick, add more stock. Taste for seasonings and add salt and pepper as desired. 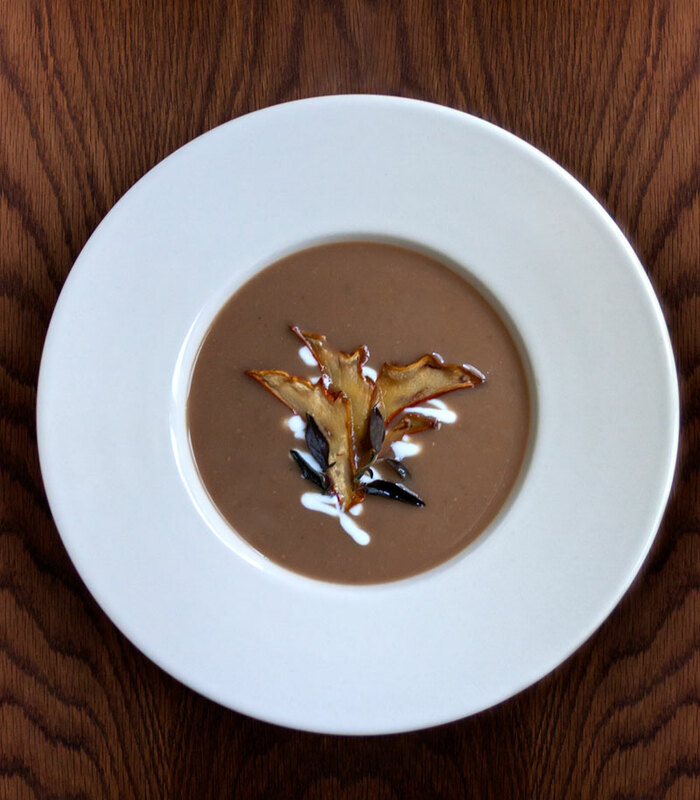 Ladle the chestnut soup into four warm bowls and decorate with a drizzle of crème fraiche or yogurt. Top each bowl with a quarter of the mushrooms and garnish with fried sage leaves (instructions below), if using. Serve immediately. The vividly herbal flavor of fresh sage leaves takes on a sharper & bolder edge when flash-fried until crisp in olive oil, heightening the soft, delicate taste of the fresh chestnuts. Wash the sage leaves, pat dry and select the best leaves for frying. Heat the olive oil in a small non-stick skillet over medium-high heat. When very hot, but not smoking, add the sage leaves. Fry the sage leaves until crisp, but not burned (about 30 seconds). Drain on paper towels. Reserve the sage-scented olive oil for other uses.